2017/03/15: Naleia appeared in the March edition of All At Sea! 2017/01/31: Naleia appeared in the January edition of All At Sea! 29/09/2016: This press release covers basic information about the beginnings of Naleia Yachting. 18/05/2016: This press release covers a launch of the new product of Naleia Yachting: The Yoga Sailing. 16/03/2016: This is the first press release of Naleia Yachting. It covers general information about Naleia Yachting. Access to the library with more photos available upon request. 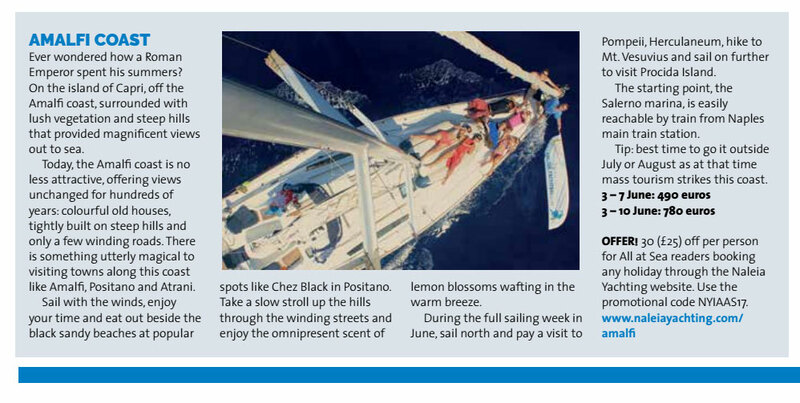 These photos can only be used in conjunction with editorial content directly related to Naleia Yachting.